The new Seaport i-Visor LS Pro MAG Laptop CaseSeaport LS Pro MAG case now has a reflective matte silver exterior for the sun shade. This helps prevent heat buildup in the case while working out in bright sunlight. Also, improved Velcro placement gives better access to the side ports. The i-Visor LS Pro MAG represents the most dramatic evolution of Seaport’s patented cases with a TriFold sun shade. The i-Visor LS Pro MAG allows professionals in many different fields to view their laptop screens with crystal clarity in any viewing environment. The new Seaport LS Pro MAG case now back in stock. Limited Supply. NEW – Silver sun hood exterior reflects sunshine to help keep the case cool outdoors. IMPROVED – Better placement of Velcro gives better access to side ports. The i-Visor LS Pro MAG is stronger and lighter then previous Pro models. Designed specifically with digital imaging in mind, this rugged case is the solution to a variety of problems. The i-Visor LS Pro MAG is ideal for shooting tethered! 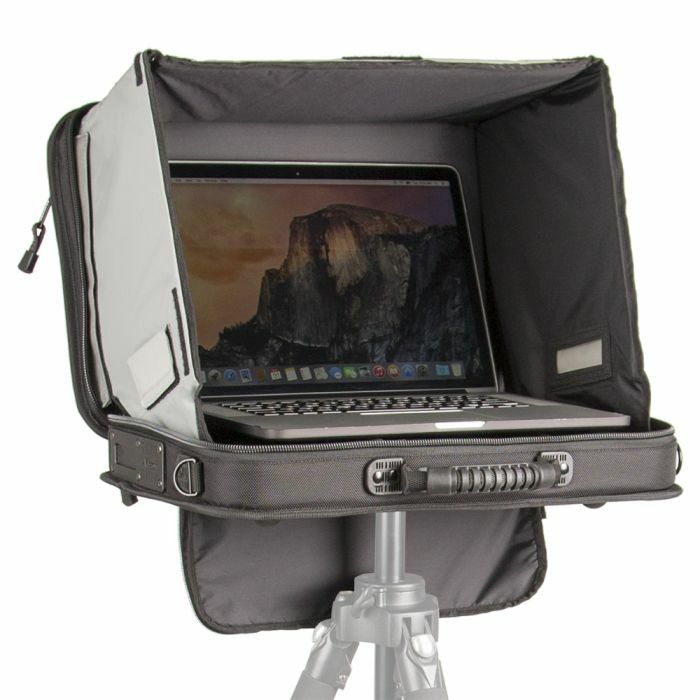 Matte silver hood exterior reflects unwanted heat to help keep your laptop cool when working in bright sunlight. Will accommodate up to a 17″ laptop. Rugged ballistics outer fabric over a padded rigid core. Built-in Magnesium alloy frame with tripod mount. Side of the case access ports for cable pass through. Ample exterior pockets for cables, batteries or external hard drives. Additional fabric Dark Cloth for ultra critical viewing. Thick cushioned elastic shoulder strap. Included new custom fit waterproof rain cover.